When 16-year-old Liam Poston moves to St. Augustine, Florida, to live with his aunt, he hates everything about the tourist town, from its boring history to the old homes and buildings. An incident on the first day of school forces Liam to join the history club. The dreaded after-school activity does have one positive: the knowledgeable and attractive Bailey Deeth. The discovery of a photograph from a 1906 time capsule showing millionaire industrialist Henry Flagler sitting in an exquisite but unknown parlor resurrects a local rumor of a secret group and hidden treasure. Several pieces of Flagler’s mansion were distributed throughout the town when the structure was taken down in 1950. Finding the pieces lead Liam & Bailey to answers. Episode Synopsis: In this episode we get to hear from both partners in the writing team of Williams & Knerly. They not only talk about how Collecting Shadows grew from a seed idea to a fully developed novel, but also about the benefits of writing as a team. We also uncover a few personal secrets during the closing Rapid Fire segment & Gary makes a prediction about the season finale of The Curse of Oak Island. 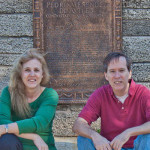 Listen to “Gary & Vicky – COLLECTING SHADOWS” on Spreaker.